What could new USCCB doctrinal head mean to future theological debate? An editorial earlier this month in The Tablet puts a bottom line to child sexual abuse, while calling for a government inquiry in Britain similar to that taking place currently in Australia. Click here to read the whole editorial. Chicago Tribune religion reporter Manya Brachear writes today that records released yesterday show that the Church kept secret a priest’s sexual abuse for many years. Read the article by clicking here. Laurie Goodstein of The New York Times writes about a new group comprising priests and nuns who have blown the whistle on clergy sexual abuse predators and abettors in the Roman Catholic Church. Click here to read the entire article. “Voices: Telling Our Stories:” lets the voice of reformers themselves tell why and how Catholics firm in their faith, but disenchanted with their Church, turn to advocacy as a way to remain whole. Only a courageous person would want to try reforming the Roman Catholic Church, a 2,000-year-old institution that practiced its liturgy in a dead language as recently as 50 years ago – and a persistently courageous person to keep trying for more than a decade. Widespread revelations about clergy sexual abuse in the Roman Catholic Church in 2002 prompted a number of responses within and outside the Church. From those responses emerged Voice of the Faithful®, a reform group that rapidly grew into an international movement. Undaunted by the effort needed to move a two-millennia-old hierarchical institution, Voice of the Faithful® members supported survivors of clergy sexual abuse, supported priests who had spoken out for reform (and sometimes had been silenced) and sought ways to ensure a responsible lay voice in running the Church. After a decade of media reports, sociological analyses and citations in thousands of news stories and books, Voices provides the words of the movement’s members themselves. These are voices of individual members who are full of hope and who continue working to break the Church’s silence, hold the perpetrators of scandal accountable and foster justice and healing for the Church. These Voices are from faithful Catholics who, in many cases, are former or present parish Eucharistic ministers, religious education leaders and pastoral council members, or who otherwise serve centrally in parish life. They refuse to remain silent while their Church hierarchy protects itself instead of the weak and innocent. Voices: Telling Our Stories reveals personally who Voice of the Faithful® members are, why they joined and remain a part of the movement, what being Catholic means to them, what they look for in their Church today and what they see in a reformed and renewed Church of tomorrow. 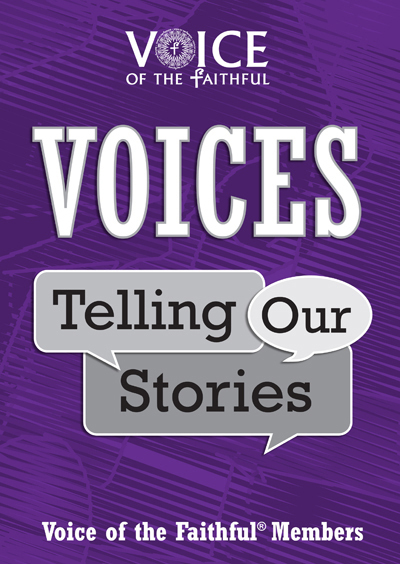 Voices: Telling Our Stories may be purchased online by clicking here and on Amazon.com. Voice of the Faithful®: Voice of the Faithful® is a worldwide movement of concerned Roman Catholics working to support survivors of clergy sexual abuse, support priests of integrity and increase the laity’s role in governance and guidance of the Church. More information is available at our website.